Among the 40-plus openings Union Square saw this year we welcomed 28 new restaurants. Haven't had a chance to try them all yet? Join us on September 14th to taste unlimited dishes from restaurants new to the Union Square culinary scene, alongside some of your distinguished favorites. Restaurant Chair Gadi Peleg's newest venture, Nur with Israeli Chef Meir Adoni, features a Middle Eastern experience of remarkable flavors on 20th Street, so remarkable it has already earned two stars from New York Times restaurant critic Pete Wells. Between its delectable eggplant carpaccio, Palestinean tartare, and Yeminite kubaneh we can't wait to try what Adoni's cooking up for Harvest. Momofuku's delivery-only restaurant Ando began cooking and delivering out of a new kitchen on 14th Street this spring. The menu takes inspiration from Korean and Thai staples, and your favorite late night city grub and then transforms them to simple food that's inspiring, one-of-a-kind and most importantly, delicious. 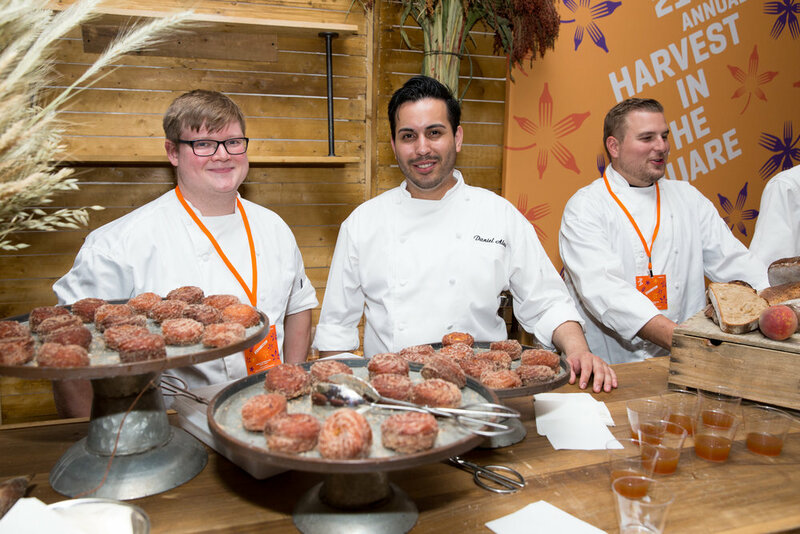 Harvest 2016 attendees received an exclusive taste of the now infamous Daily Provisions cruller when they attended last year's event prior to opening. We promise you won't be disappointed in the off-menu item they'll be taste testing on Sep. 14th. Union Square's newest poké purveyor Pokéworks on 15th Street is serving up superior seafood under the Harvest tent this year. Founded in 2015, the restaurant brings the Hawaii island favorite inspired by sustainable, seasonal and natural ingredients. At his new American brasserie at the Hyatt Union Square, Chef Ron Rosselli serves flavorful and thoughtfully prepared dishes inspired by the Union Square Greenmarket. Expect to see the first fall veggies available incorporated into delectable bite sized servings. Originally from Portland, Salt & Straw joined forces with Union Square Hospitality Group to make its East Coast debut. They've collaborated with Daily Provisions on local flavors like Salted Caraway Rye (a bread sold at Daily Provisions) with Strawberry Cheesecake, and Joe Coffee & Freckled Chocolate. We welcome founders Kim and Tyler Malek to Harvest this year.